Old people doing cute things is almost as good for the internet as kitten pictures and surprise marriage proposals. They’re a winner every time. 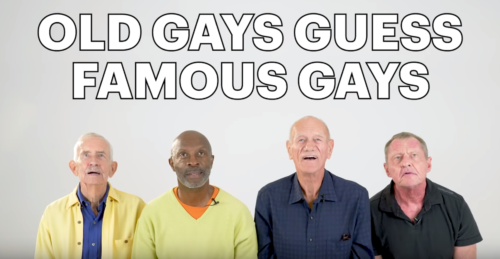 So when Into put four elderly gay men in a room and ask them to identify modern queer celebrities from photos, the web quickly fell in love with the cheeky quad and their cluelessness. They nail a few of them quickly – Troy Sivan and Gus Kenworthy seem to be particular favorites for the 65+ set – but watching them guess on most of them will bring out the giggles. If you need a refresher too, the lineup they’re shown is: Keiynan Lonsdale, Ezra Miller, Zachary Quinto, Jussie Smollett, Jim Parsons, Diego Sans, Andrew Rannells, Tommy Dorfman and Brandon Flynn, Titus Burgess, Kevin Spacey, Rock Hudson, Todrick Hall, Troye Sivan, George Takei, Tyler Oakley, Billy Eichner, Antoni Porowski, Ricky Martin, Adam Rippon, and Gus Kenworthy.